Can anyone give name or information please. Photo courtesy of Wayne Parkes from the Tesh-Cutts family album. 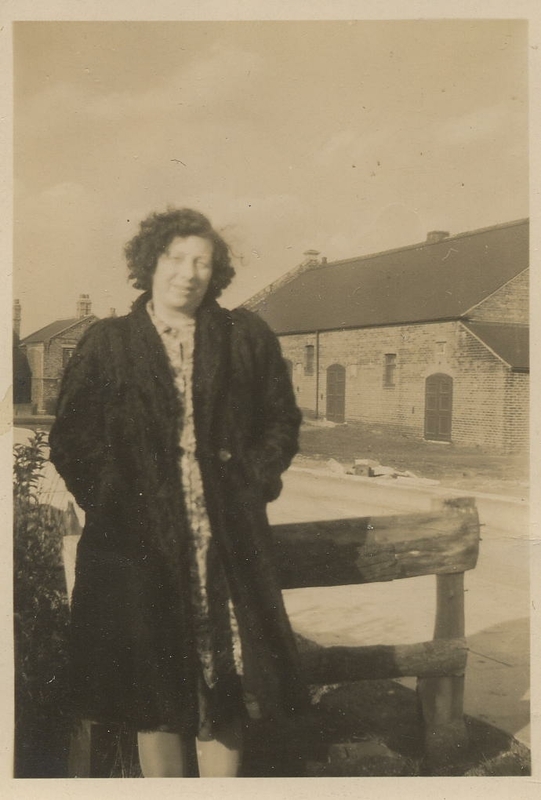 This is my nan,your great gran Wayne .Ivy Tesh who lived next to Keith Sharpe on Sheffield Road They were the first family to live there when the row was built.Their neighbours were Len and Ivy Doxey my godparents. You are correct Janet. This photo must date from during the war as it looks as though the road was still under construction. You probably recall that there was a post and wire netting fence between the pre – fab road and the picture house. I don’t know who the lady is, but she is standing alongside the brand new Pre-fab road between the Empire Cinema and Hutchby’s Row. on Sheffield Road. Hi John its me again just had a thought that’s me in the school photo just posted on the photo gallery and it was taken just about the time I was old enough to go in the chicken run.I vaguely remember being scared to death at seeing king kong or it may have been mighty joe young both great pictures.